The news of Oregon’s Easter weekend flash mob attack has made the local news, radio talk shows and now national attention (The Indiana Republic, Drudge Report). 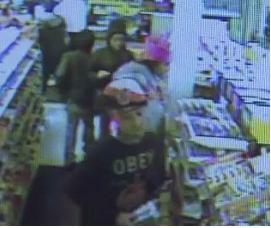 As many as 20 youths participated in a flash mob (theft ring) of a Portland Chevron gas station. Video surveillance showed the young men filing into the store one by one. Then suddenly they began stealing anything they could take and began leaving with handfuls of stolen goods. However, it did not end there. Several of the youths came back to the store parking lot to harass the store clerk. The ages of the robbers were from 14 to 18 years old. The surveillance video offers hope in catching the criminals. In Maryland, a flash mob robbed a local store and the video of the crime was broadcasted widespread which helped greatly in identifying the culprits. As a result, most of the suspects turned themselves into the local police station and apologized.